Does giving feedback cause you to toss and turn at night, procrastinate on delivering it, disappoint you when it doesn’t make a difference, or frustrate you because it instigates an argument? No matter what your role, you are probably in a position multiple times a day to give people feedback about their past or current behavior—with the hope of motivating their future behavior. If providing feedback is part of your job or something you do in your personal life almost daily, why can it be so challenging? 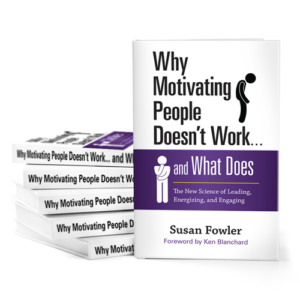 I hope you discover answers and useful information in this three-part series on how to deliver effective feedback drawing on the science of motivation. Maybe it will help you overcome your insomnia, procrastination, disappointment, or frustration—at least when it comes to feedback! Realize that feedback is always motivating, but not necessarily as you intended. Both statements are examples of personalized feedback—information steeped with your judgment. Both are risky. The first example, praising Sara for her work, risks having Sara embrace the feedback for the wrong reason—to please you. The second example, expressing disappointment in Sara, may prompt her to change her behavior in the future, but also for the wrong reason—to avoid guilt, shame, or fear of not meeting your expectations. In both cases, you risk Sara developing an external need for your praise. Without your ongoing validation, research shows Sara may stop submitting reports on time since her reason for doing it, her reward for acting, has been removed. You are amazing (wonderful, terrific, the bomb). I am so disappointed in you. Remember why you provide feedback in the first place: to develop an individual’s competence and commitment on a meaningful goal and to facilitate high-quality, sustained performance. Giving personalized feedback puts these outcomes at risk. There is real science behind effective feedback. Neuroscience demonstrates how praising stimulates the reward-center of our brain. Motivation science has well documented the eroding effect of tangible rewards on productivity, creativity, innovation, and sustained effort. Intangible rewards, such as praising, tie to people’s need for status, power, and image, and have the same eroding effect. In the second example above, pointing out a person’s unacceptable behavior by cloaking it in your disappointment can lead to an imposed motivational outlook. Motivation science has shown that people working from this sub-optimal outlook to avoid feelings of guilt, shame, or fear, are more prone to emotional and physical stress—and as a result, are less creative in the short term and less productive in the long term. Ironically, your well-intentioned praise or expression of disappointment is likely to erode people’s sense of autonomy. They may become more dependent on your opinion of their effort, outcomes, and self-worth than on their own judgment. If Sara finds value or joy in preparing reports and delivering them on time, what is the purpose of praising her? She might even question why you feel the need to praise her, finding it irritating, inauthentic, or manipulative. But, the biggest risk is that your praise could cause her to shift her attention from her real—and optimal—reasons to perform to sub-optimal reasons: to please you or avoid disappointing you. Don’t confuse personalized feedback with expressions of gratitude. Personalized feedback is risky, but you should never shy away from genuinely expressing your thanks. Communicating your gratitude is powerful. What is the difference between expressing gratitude and giving personalized feedback? Intention. Your expression of gratitude is not intended to change or reinforce people’s future behavior. Your statement of thanks is not an attempt to develop their competence or sense of responsibility—nor are you looking for a guarantee they will keep up their efforts in the future. When you express gratitude, it is based on your need, not theirs. Your gratitude, delivered candidly and authentically, without ulterior motives or expectations of future behavior, gives people the choice to continue acting wisely, deepens their sense of contribution and connection, and validates their competence. Remember, your feedback is always motivating. The question is whether your feedback is more likely to generate optimal or sub-optimal motivation. If people are optimally motivated, through their values, sense of purpose, or an inherent motivation to perform above expected standards, they don’t need your praise. If they need corrective feedback, your disapproval will usually result in sub-optimal motivation. The science of motivation provides alternatives. In part two of this series, we explore a type of feedback more apt to generate optimal motivation. Find part three here.